Making that first big step between being a smoker and transitioning to the world of vaping can often be an extremely difficult switch. There’s no doubt at all that vaping is much healthier and cost-effective compared to smoking, but finding that one device that will make the transition as seamless as possible can easily prove to be quite challenging. The AIO (short for All In One) features a great design with features that are all incredibly easy to use. Although it lacls certain elements experienced vapers would like to see, the AIO isn’t intended for experienced vapers. Instead, the eGo AIO aims to be the best vape around for making the switch from smoking, but how does it perform in the real world? My name’s Sarah Wiggins, and we’re going to find out all of that and so much more in my Joyetech eGo AIO starter kit review. While vapes with tons of features and limitless settings certainly are nice, the eGo AIO aims to be your one-stop solution as the best possible vape for people making the switch from cigarettes or anyone else looking to try out vaping for the first time. It offers a great design, fantastic flavor, and most importantly, great ease-of-use, for a surprisingly low price. As you’ll soon discover throughout my review, there’s a lot to love in this little package. The eGo AIO comes as a starter kit, and while starter kits aren’t anything new in the world of vaping, the amount of goodies that you get with the eGo AIO for its extremely low price really is a great treat. In addition to the vape itself, the starter kit also comes with two 0.6ohm atomizer heads, a drip tip that’s made out of glass, a spiral drip tip made out of plastic, a USB cable for charging, and an instructional manual. The tank on the eGo AIO certainly isn’t the biggest one that I’ve ever used (more on that in the cons section), but it is a breeze to refill. Joyetech has implemented a top-fill design, and this means that filling up the tank on the vape is incredibly easy and simple to do. Additionally, Joyetech has also added a child-proof cap. Opening the cap to refill the tank requires you to first push down on it, and it acts as a great safety feature that I’d definitely like to see implemented in other vapes. Joyetech has included a 1,500 mAh battery with the eGo AIO, and while that may not sound like a large capacity at first, it actually proved to be quite efficient with vape's the smaller size. Most users should be able to easily get through a full day of use with the Joyetech AIO, and if you’re using it more sparingly, it might even be possible to go two full days on one charge. To put things into comparison, the Innokin Endure T18 is larger than the eGo AIO, yet it has a much smaller battery at just 1,000 mAh. Taking that into consideration, the 1,500 mAh size on that eGo AIO is that much more impressive. When looking at different vapes, it’s easy to get caught up talking about all of the tech that’s packed inside of them. There’s nothing at all wrong with this, but it can sometimes be easy to overlook one of the most important aspects - taste. So many vapes offer a ton of new tech, but tend to fall behind the pack when it comes to flavor. Thankfully, this isn’t an issue at all with the eGo AIO. The Joyetech AIO provided fantastic flavor with all of the different liquids that I tried, offering a strong and solid taste without being too overpowering. That’s an excellent combo that’s oftentimes not found with vapes, so it’s great to see it make an appearance. As I mentioned above, the Joyetech AIO features a rather small and compact design. This certainly has an effect on the tank size, but what it lacks there it certainly makes up for in its overall portability. If you’re looking for a vape that is easy to carry around with you wherever you are, the Joyetech AIO is a fantastic choice. The compact design and overall look means that it’s not only easy to take with you due to its smaller size, but the aesthetics keep it looking discrete so that it doesn’t draw a lot of attention to yourself while using it. I’ve already hinted at it a couple times throughout my Joyetech eGo AIO review, and now its time to talk about it directly. The eGo AIO has a very, very small tank capacity. If you’re a more experienced vaper, you’ll probably take one look at the 2ml size and walk away laughing. That’s perfectly understandable for people that are looking for a true workhorse with their vape, but again, experienced vapers aren’t the people Joyetech is trying to attract with the AIO. The eGo AIO was created to be a great first step for those looking to either quit smoking or just get into the vaping game, and while the smaller size might be a slight annoyance for beginners, it likely won’t be as big of a deal as it would be for more experienced users. If you’re new to the world of vaping, airflow control probably isn’t something that you’re going to want to play around with right away. However, after using the eGo AIO (or any vape for that matter) for prolonged periods of time, you’ll likely want to dive a bit deeper and get some more control over your device. Airflow control certainly is possible with the eGo AIO, but the lack of markings on the vape make it a bit difficult to properly adjust it to the settings that you’d like. I did eventually discover that the best experience with the eGo AIO takes place when the dot on the unit is moved 90-degrees to either the left or right of the primary marking, but additional markings certainly would have made adjusting the airflow on the AIO much easier. In an attempt to give the eGo AIO a bit of added flair, Joyetech has included 7 different LED lights on the unit. These lights come to life while firing on the AIO, and it certainly is a sight to behold. However, if you’re looking to save some battery or don’t want to disturb others around you, you can easily turn these off if you don’t want to see them for whatever reason. Recently, we’ve been seeing more and more vapes come equipped with a sort of bypass mode. This mode allows you to vape with the eGo AIO while it’s on the charger, meaning that a low or dead battery doesn’t necessarily mean that you can’t vape. Not everyone will make use of this feature, but it’s something that I can certainly see coming in handy if you want to take a puff or two but forgot to charge up your vape the night before. It’s a really great convenience feature. I’ve already mentioned it in this review, but it’s worth saying it again. The eGo AIO is an incredibly easy device to use, and that’s part of what makes it such a great choice for people who are just switching over from cigarettes or something else. Between vaping, charging, and refilling the AIO, everything is dead simple. This overall simplicity might be seen as a negative by some, but for those just getting into vaping, the Joyetech AIO couldn't make things any simpler. Joyetech includes a couple drip tips with the starter kit for the eGo AIO, but the one that’s preinstalled out of the box is actually surprisingly great. This particular drip tip features a spiral design, and this build means that the eGo AIO does as great job at preventing any kind of spit-back that can easily take place with other competing units. As you've seen, there sure is a lot to love about the Joyetech eGo AIO. 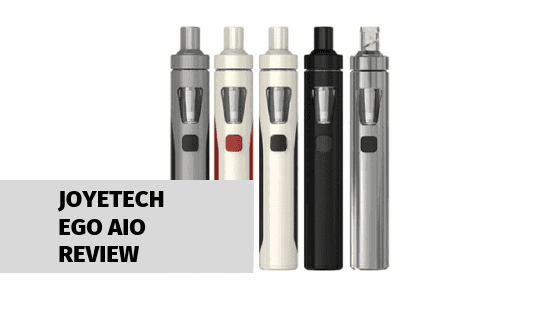 Joyetech has crafted a truly fantastic product for beginners that just want to start out with vaping, and between the compact design, overall ease of use, great battery, and more, it’s hard to complain about the eGo AIO. If this Joyetech eGo AIO review has you wanting to purchase one for your own, get ready for the best part. At only $19, the AIO is an absolute steal! You can check out more starter kits or read reviews of Joyetech's Unimax 25 and Exceed D19.